We have featured the announcement of the 10 x Finalists for the CE Design Contest who will engage in the CE Final Battle, but have not revealed exactly WHAT the "contestants" will be doing, until now! The designers are to be paired-up (1 x Thai designer + 1 x International Artist) an work together on the theme "Love & Friendship", with products to be printed and produced "live" at the event itself! The final products include 2 x Custom CEs and 2 x Products in the same graphic design theme as on the CE model. The grand prize is 100,000 Thai Baht for the duo! 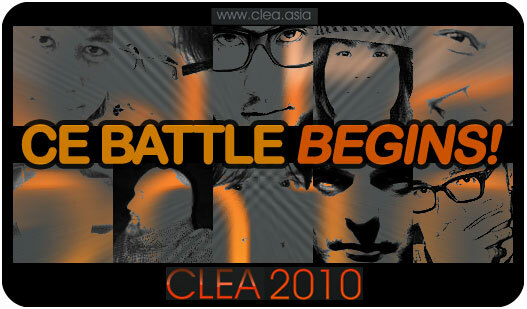 CLICK THRU to find out who have been randomly picked by the judges for the 5 teams, and do pop by CLEA 2010 from September 3rd to 5th @ Royal Paragon Hall, on the 5th floor of Siam Paragon, Bangkok, Thailand! Let The Battle Begin! Interesting lineup. Good luck. Looks like they are in for a different event will be interesting to see how they overcome obvious obstacles such as design style, language and ego barriers etc. four buddies on the finalists! will be cheering all of you!